We are Prepared to Deal with All the Mess You Might Find with Bathroom Renovations in Mooresville & Lake Norman, NC, and We Have the Time to Make Sure the Job Gets Done Right! Bathroom Renovations in Mooresville & Lake Norman – When you think of bathroom renovations, several things may come to mind: money, time, and a big mess! You could also add to that list with mold, water damage, and who knows what else you may find lurking under the edge of your tub or around the base of your toilet when it gets ripped out. Bathroom renovations can be quite daunting, messy, and complicated, but if you want your bathroom renovated, then that’s exactly what you will get from us. Here at Chad Goodin Signature Homes, we are prepared to deal with all the mess you might find with bathroom renovations, and we have the time to make sure the job gets done right. You will be consulted with and informed every step of the way, but you’ll never have to deal with the daunting task of figuring out how to get your dream bathroom. You give us the ideas, and we make them realities! You will be surprised by what we can accomplish. With over 30 years of experience behind us, we serve residents of the area around Mooresville and Lake Norman, North Carolina. Our trained crew can make your bathroom renovations seem quick and simple. From drawing up the initial idea to creating plans and executing them, we work with your ideas, giving you options to make this new bathroom yours, and asking your opinion before moving forward with any changes. 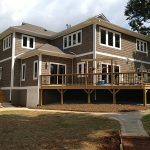 With your idea and our expertise, we can create the dream home you have always wanted. Contact us for more information on bathroom renovations. At Chad Goodin Signature Homes, we proudly perform bathroom renovations in Mooresville, Cornelius, Davidson, Huntersville and the surrounding Lake Norman area of North Carolina.